Do you always have to be in a calorie deficit to get best fat loss results? The evidence suggests not. Diet breaks improve metabolism health and reduce the risk of metabolism slowing down. Implementing regular diet breaks are worth considering, especially if you are a female due to possible negative impacts on the menstrual cycle, which can occur in just 5 days, if calories are too restricted. Diet breaks have huge metabolic benefits, for example you can eat more calories to maintain weight and therefore less likely to put on weight on occasions like holidays, xmas etc. Also diet breaks offer a huge psychological benefit, to get out the mindset of ‘dieting’ and watching what you are eating all of the time. 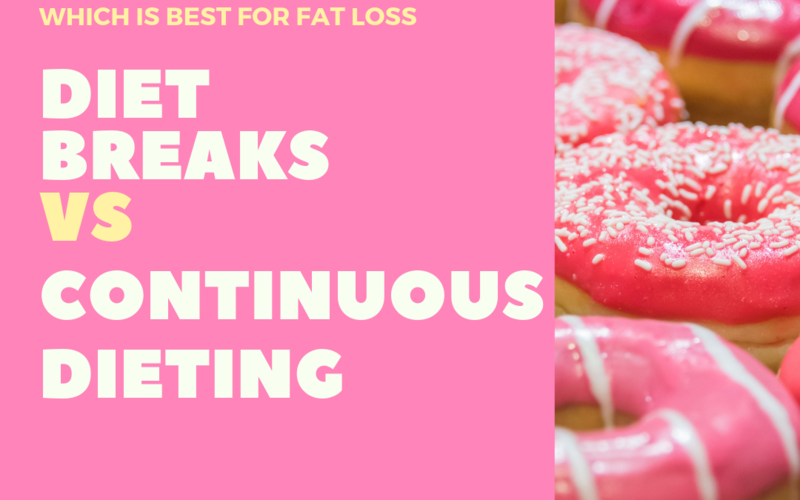 This is not to say diet breaks are for everyone, continuous dieting does have its place. For example if you have a tight deadline like a holiday coming up that you want to lose weight for. Also losing weight fast can be a big motivator for a lot of people, which can also make it a valid option.